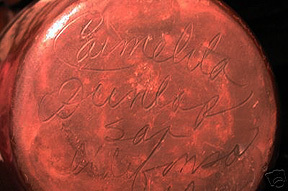 Carmelita Dunlap was the niece of Maria Martinez, who is considered the institution of San Ildefonso pottery. 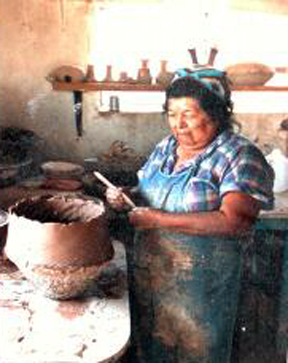 Carmelita was born in 1925 and learned pottery making by watching her aunts Maria and Desideria Montoya. Carmelita's mother passed away when she was very young and Maria and Desideria raised her from then on. Carmelita was considered the last living protégé of Maria until her death in 2000. Carmelita Dunlap was born in 1925, and when her mother passed away at a young age, Carmelita was raised by her aunts, Maria Martinez and Desideria Montoya. She learned pottery from her aunts and she was considered to be the top protege of Maria, of that generation. 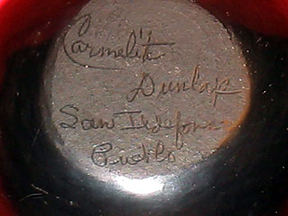 Carmelita passed away in 2000. 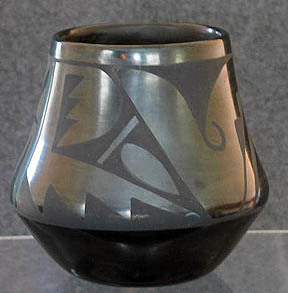 She skillfully painted motifs of nature's elements in balanced, rhythmic designs onto the polished surface using a yucca brush dipped in clay. She was known for her beautiful painting of large size pots in black-on-black, cream-on-red, and sunrise brown being the family’s specialty. 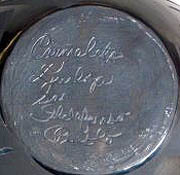 Carmelita was designated a National Treasure during the Nixon administration. She won Indian Market first place twenty times which is still to date unprecedented. Cynthia Starflower, Carmelita's daughter, since her mother’s death is second in line to Maria Martinez. 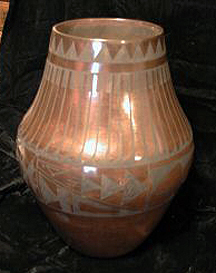 She brought back the "Sunrise" brown pottery seven years ago after her brother Carlos passed away. She is also one of the last Grandmaster potters currently working in San Ildefonso Pueblo. 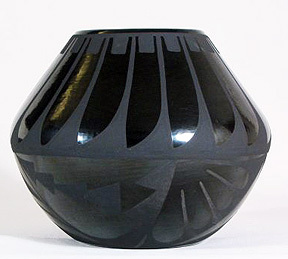 Her daughter Linda Dunlap is a master potter with beautiful burnish work and is third in line to Maria.